Photo by Brandon Macz: Residents are still fighting plans to replace moorage at the Lakewood Marina, which could start next year. 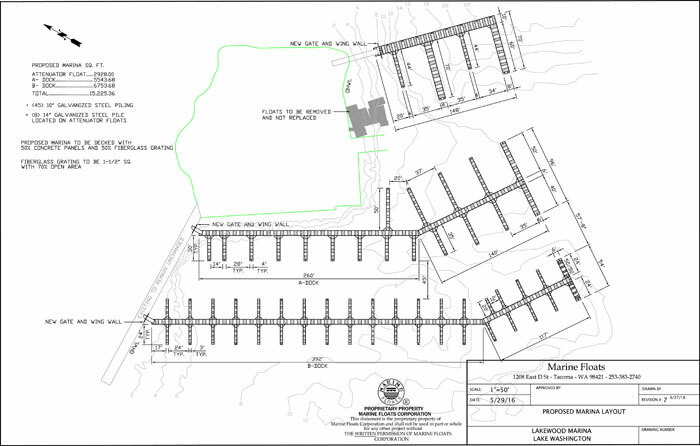 Plans for the future Lakewood moorage reconfiguration. 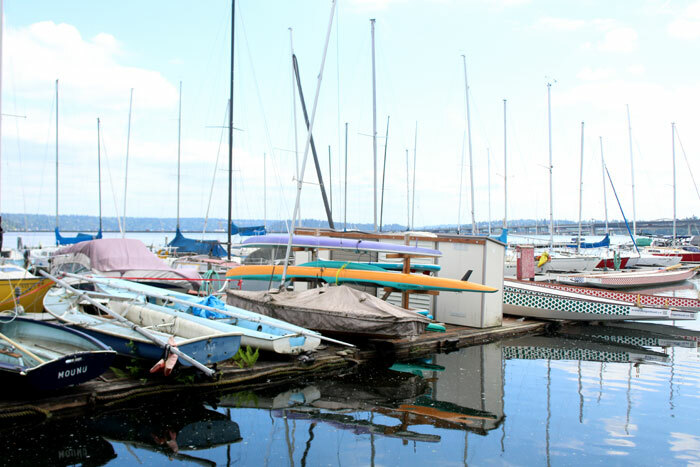 The South Leschi marina is in the most need of replacement due to its state of disrepair. 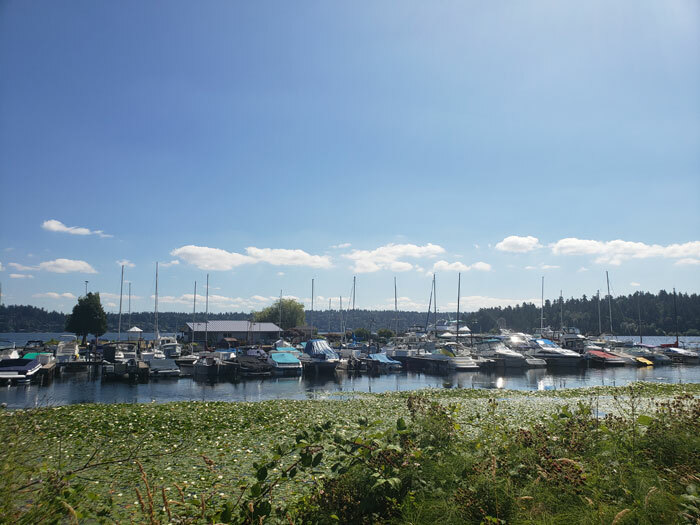 Marina Management partner Peter Joers expects permitting for replacing Leschi and Lakewood’s public moorage to come through in time for a spring 2019 start date. Meanwhile, residents continue to appeal decisions by the City of Seattle to turn over management of the marinas to a private operator while also pushing for more environmental scrutiny. Amid protests from residents who use the current facilities, the city council in August 2017 approved Seattle Parks and Recreation entering a long-term lease agreement — at least 20 years — with Marina Management to maintain, operate and improve public access to the North Leschi, South Leschi and Lakewood Moorage public marinas. The private operator took over management of Seattle’s marinas in January. Friends of Lakewood Moorage filed a motion for summary judgment in King County Superior Court, arguing the city failed to hold a public hearing — as required under Initiative 42 — before approving the lease. The court determined in April that the city’s lease with Marina Management did not trigger Initiative 42 requirements, and subsequently denied a motion to reconsider. The judge said it is clear the City of Seattle does not have the funding resources required to make the needed improvements to the marinas, and that the intent is to make them more open to the public. She did agree that it appears the moorages, particularly Lakewood, would be changed to accommodate larger boats, but that fact was not relevant to the case. While the ordinance was not “crystal clear,” the judge said the city did hold a hearing before it signed a lease with Marina Management, and was in compliance with Initiative 42. Last year residents living near Volunteer Park were unsuccessful in using Initiative 42 to fight the loss of parkland for the Seattle Asian Art Museum expansion. Lakewood would lose all 12 of its 20-foot slips under the new configuration proposed by Marina Management, as well as 12 30-foot slips. Seven 50-foot slips would be added, plus one 54-foot slip, two 35-foot slips and a 96-foot slip, none of which are current options at Lakewood. Despite some residential claims, Joers said, the shore does not provide the means to create a yacht basin. None of these moorage figures include dry dock space or guest moorage facilities. Friends of Lakewood Moorage member Jeannie O’Brien said plans to replace two docks with larger slips will not only result in larger boats being able to dock at the marina, but it will also result in higher fees that are expected to push out longtime tenants and their smaller sailboats. Rates at the Lakewood and Leschi marinas are already low, he said, because of their current condition. A 24-foot slip at one of these marinas has a $196 monthly rate, where a 25-foot slip at Harbor Island West Marina has a monthly rent of $431.25. Parkshore Marina in Seward Park charges $250-$260 per month to rent a 26-foot slip, while Leschi and Lakewood marinas currently charge around $212. The nearby Spinnaker Bay Marina has 30-foot slips for rent at $350 per month with a one-year lease, while Leschi and Lakewood currently charge $244 a month at that size. Leschi South tenant Remmert Wolters said he expects the rate he pays to go up 50 percent when the marina project is completed. Leschi South is proposed to lose all 30 of its 24-foot slips, but will have 52 25-foot slips in its replacement, and another 52 30-foot slips and two each of 60- and 62-foot slips. The replacement project also cuts 60 26-foot slips, which are not considered usable. Seattle Parks and Recreation had been taking income from the moorage rates for years, Wolters said, but without any significant maintenance in 15 years. Wolters said the private operator has taken over neglected moorage with derelict boats that haven’t paid fees in years. Removing those vessels is now also Marina Management’s problem. “The boats, you literally cannot give them away,” Joers said of the derelict vessels left at the marinas. O’Brien, an attorney, whose family uses Lakewood Moorage for its 24-foot motorboat, said Marina Management lied when it communicated to residents that usage wouldn’t change after construction. There is an existing building on Ohler’s Island that provides Lakewood tenants with shower facilities and other amenities, but the lease agreement contemplates adding to the marina a food and beverage concession, plus kayak, canoe and paddle board rentals. While some residents would prefer to have the docks replaced in the same configuration they’re in today, Joers said the city wouldn’t permit such a project, because the current marinas are not up to code. Pilings have to be replaced, the docks have to be ADA-accessible and there are also coverage standards, he said. Widening slips means losing some spaces. Joers adds there has been a steady decline in purchases of small boats, but that those vessels are also easier to pull out of the water and store on a trailer, as opposed to larger boats that require year-round moorage. The South Leschi marina is in the worst condition of the three, and needs to be replaced first. The outer row of floats at South Leschi were removed in July 2017, according to Seattle Parks and Recreation’s Determination of Non-Significance, because they had sunk and created what the Seattle Department of Construction and Inspections deemed a safety hazard. Putting a plywood surface down at South Leschi would help create more “structural rigidity” in the interim, Joers said, but is not feasible due to current conditions. North Leschi, which is expected to be replaced last, is gaining one 60-,70- and 80-foot slip, plus an additional 25 25-foot slips. All 43 of North Leschi’s 28-foot slips and 46 38-foot slips will go away. Plans are for 22 30-foot slips, 21 slips at 40 feet and 10 at 50 feet. Breakwaters keep waves from hitting the marina, while pumpout stations allow people with bathrooms on their boats to dispose of their waste. O’Brien said boaters currently use mobile pumpout services. These two parts of the project will be handled by the city. Joers said the City of Seattle will manage the installation of breakwaters and pumpouts on its own schedule. Plans are to construct the new moorages offsite, then demolish the old structures, and tow in the new docks. Joers said Marina Management is still working on plans for relocating current tenants when demolition starts at their marina. Friends of Lakewood Moorage also argued in its motion for summary judgment that the city did not follow the State Environmental Policy Act, which requires further environmental analysis of the impacts of the replacement projects. 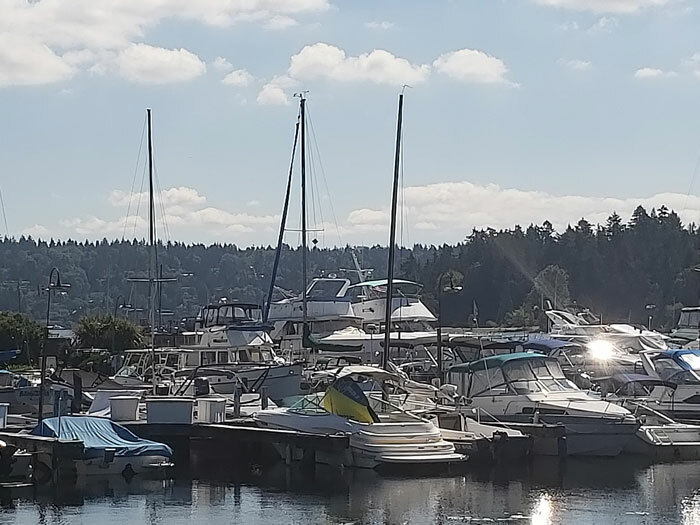 Shaffer determined that a SEPA action was not required because the use of the property for moorage will not change, and the lease between the City of Seattle and Marina Management contemplates environmental review as development permits come through. O’Brien tells MPT that larger, diesel-powered boats using the marinas will have an increased negative environmental impact, as will increased activity planned at the marinas. Friends of Lakewood Moorage is continuing the fight through the Washington Court of Appeals. O’Brien independently filed an appeal with the Seattle Hearing Examiner regarding the Determination of Non-Significance (DNS) issued by SPR, which is a decision that a major environmental analysis of the proposed replacement project isn’t required. The Seattle Hearing Examiner will take testimony during an Oct. 17 hearing, which is set for 9 a.m. at the Office of the Hearing Examiner, Room 4000, 700 Fifth Ave. The city had attempted to find a private operator back in 2013, but put those plans on hold because of public backlash. Wolters said the threat of condemnation of South Leschi, because no one wanted to insure it, caused SPR to start searching for another operator two years later.